The Union Home Minister, Rajnath Singh, chaired a meeting of the High-Level Committee (HLC) at New Delhi on Friday to consider additional Central assistance to the States of Arunachal Pradesh (affected by floods/landslides during 2017-18) and Nagaland (affected by floods/landslides during 2017-18). The HLC approved additional assistance from the National Disaster Response Fund (NDRF) – Rs 144.26 crore for the State of Arunachal Pradesh and Rs 65.69 crore for the State of Nagaland. The Union Minister for Agriculture, Radha Mohan Singh, Union Finance Minister, Piyush Goyal, Union Home Secretary, Rajiv Gauba, and senior officers of the Ministries of Home Affairs, Finance and Agriculture and Niti Aayog were present in the meeting. 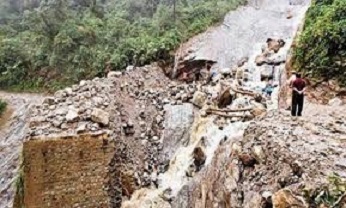 It may be recalled that in August last year, surface communication in several parts of Arunachal Pradesh got disrupted in the second wave of floods and landslides triggered by incessant and heavy rains. Heavy showers had also triggered landslides in different parts of the State. The Noa Dihing and the Lohit rivers along with their tributaries were all in high spate. Around 2,000 hectares of agriculture land was being inundated by flood water. Incessant rains had also led to flash floods and landslides in several areas of Nagaland last year. Floods left behind a trail of destruction – crops and plantations destroyed, livestock swept away and many families in the villages of the State were rendered homeless. Heavy downpour had also damaged houses and landslides affected road transport in several parts of Nagaland. A stretch of the Dimapur-Kohima National Highway-29 was badly damaged near Kiruphema village.